I taught special classes Monday, Tuesday, Wednesday, Friday, and Saturday of Aiki Peaceweek 2012 for students from Aikido of Berkeley, Free Aiki Dojo, and Golden Bears Aikido at UC Berkeley. 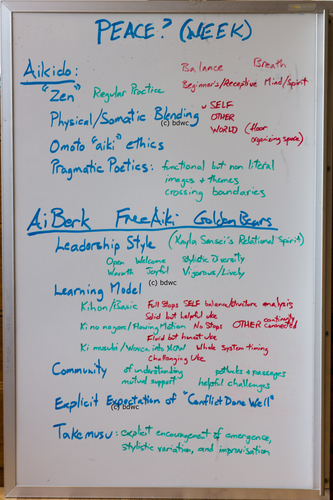 The video below is of my concluding talk on Saturday and puts the whiteboard and notes below into context. Please feel free to sign in and comment, or request an account in order to do so. What tools does aikido present to the practitioner which immediately lend themselves to practicing peace? Pragmatic Poetics: functional while non-literal images and themes which cross usual boundaries into other area of practice. What tools are offered at Aikido of Berkeley, Free Aiki Dojo, and Golden Bears Aikido, in particular, which lend themselves to practicing peace? Explicit expectation of "Conflict Done Well"